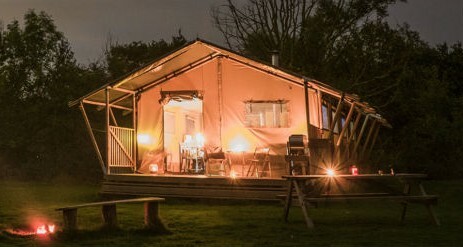 Hidden Meadows Glamping on the Suffolk Norfolk border is in easy reach of Southwold, Aldeburgh and historic city of Norwich. 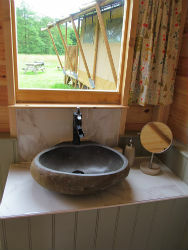 The glamping site is set in 25 acres of wild flower meadows, woodland and hedges, ponds, readbeds with a large stream meandering through the middle. Perfect for a quiet relaxing walk at any time of day. Who knows, you may be lucky enough to spot a kingfisher! We have worked closely with Suffolk Wildlife Trust and The Woodland Trust to preserve and enhance this rich and varied site, using eco-friendly methods when possible to manage and maintain the diverse area of nature. There are many different species of flora and fauna for you to see and enjoy and by staying at Hidden Meadows you are helping us to protect this truly amazing site. 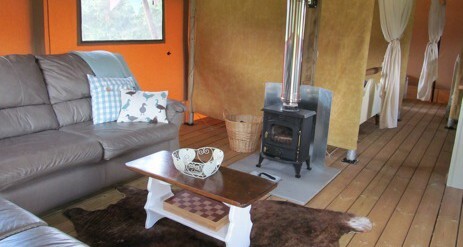 Our Three Safari Tents are sited in our meadows, a car free site, with views of the surrounding meadows and woodland. They are furnished and equipped to a luxury standard so that you have everything you need for your ‘get away from it all’ holiday. 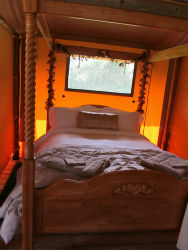 KINGFISHER TENT sleeps 4 to 6 people in 1 Double Bed, 2 Singles and optional 2 Single fold away beds. Kingfisher also accepts up to 2 dogs. You may bring a small (up to 2 person) tent with you, to put up next to your safari tent for an extra £5 per night but please let us know at the time of booking. Shower with plenty of hot running water! 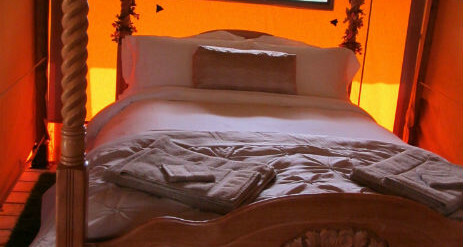 There is no electricity within the safari tents lighting is supplied by solar powered awning lights, lanterns, and tea lights. Each safari lodge has its own secure locker with a plug socket inside for re charging phones located near the car park. A safe distance from the tents is a 1/3 acre pond stocked with wild fish for the exclusive use of our guests so why not bring your fishing rods or hire ours. For a small extra cost we can include some things that we think will make your Suffolk Camping experience that little bit more special! Includes a selection of homemade sandwiches, savouries, cakes and scones with clotted cream and jam, plus a jug of Pimms or traditional lemonade and tea served on china tableware and cake stands. Table set with linen and flowers served either on the tent veranda or inside the tent. 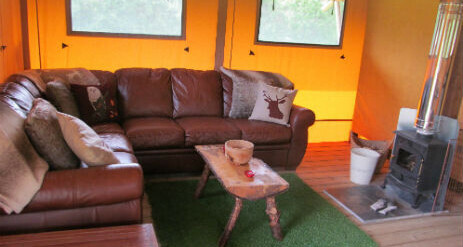 A home made cottage pie with fresh veg and gravy or a vegetable lasagne plus a fruit crumble and custard; enough for 4 people, all delivered to your tent upon your arrival or at any time during your stay . if you have any special dietary needs e.g. diabetic, gluten free etc. Please ring at time of booking and we will do our very best to cater for your needs. Tailored to your requirements: birthdays, anniversaries, wedding proposals etc. (please ring at time of booking to discuss your requirements and obtain a price). Suitable for anyone wanting to understand their natural surroundings a little bit better. Includes knot tying, identifying animal signs and tracks, how to navigate using a compass (and how to navigate without a compass), how to make a shelter and camp fire, and basic survival skills etc. Children under 16 must be accompanied by an adult, minimum of 2 persons required, session to last approximately 2-3 hours. Suitable for experienced rifle users or complete beginners as full instructions given by a qualified instructor who remains with you throughout the session. You will be able to shoot at a variety of targets and have the option of taking home your paper target to prove what a good shot you are! Minimum age is 8 years and over, children 16 and under must be accompanied by a responsible adult, minimum of 2 persons for a session to take place. Kingfisher safari lodge – only for stays from 1st May to 1st November – We are happy for you to bring up to 2 well behaved dogs when staying in Kingfisher at a cost of £25 per dog per stay.We will provide dog bed or dog crate,bedding,towel,dog bowls,poo bags,bag treats,corkscrew tethering stake and extra long lead for it .Terms and conditions apply please read before booking or give us a call.Dogs are not allowed when booking more than one safari lodge. There are so many local activities available near to you when at Hidden Meadows, below is just a small selection with many more to be discovered! To enhance your stay we have arranged a range of discounts with some of the local providers, more details given in your welcome pack upon arrival. Due to the wild nature of the site – i.e. 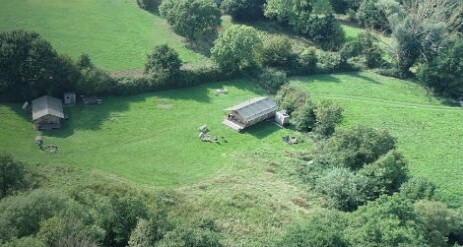 uneven ground in places, unfenced water, wooden bridges to cross and the fact that the camp site is car-free; requiring a degree of walking from the car park (help with luggage is provided) – Hidden Meadows may not be suitable for people with mobility problems, please ring and enquire as to the suitability of Hidden Meadows for your holiday party’s needs before booking.